JSyn can be called from Java Applets that run in most web browsers, except Chrome. To find out why it doesn't work in Chrome click here. If you see a message "Missing Plugin" then you do not have the Java plugin. Click here for information on how to install the Java plugin for your browser. After you install the Java plugin, you may see an alert at the top of the browser page. You can click there to allow the Java plugin to run. 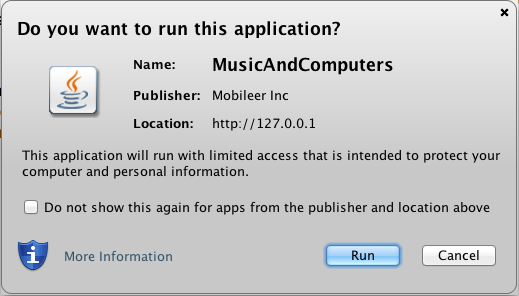 The first time you run a Java Applet from a website you may see a message like this. Mobileer Inc is the parent corporation for "softsynth.com". After all these steps you should be able to run multiple Applets on a website without seeing any more dialog boxes.